I love the Berner Oberland. I love the huge snow-covered peaks and glaciers. I like the tranquil valleys and bucolic farms. I adore the blackened timber chalets with their colorful kitchen gardens, sunny decks and Swiss flags flapping in the breeze. Maybe it’s my German heritage that drives me, but I find the tall glasses of Weiss beer refreshing, and I crave the flavor of rösti when a cool wind blows down from the peaks. The Oberland is a magical place, and it offers everything a mountain lover could ask for. Not only can you hike, climb, bike, parasail and raft, but you can also bed down in a quiet chalet while the sounds of bells and bleats softly lull you to sleep. Everything is clean. Everything runs on time. Cute little trains, trams and buses whisk you away to every enchanting place you need to go. It’s a Disneyland for adults, though I’ve known a lot of kids that love it too! Since one trip through the Berner Oberland just wouldn’t be enough, we offer three guided tours through the area this summer. And, while all three trips explore the exact same region by foot, they each offer something unique and special. By starting in Gstaad, on the western-most side of the Berner Oberland, the Eiger Trail gives meaning to the word “anticipation.” We’ll start out at a relaxing pace, hiking eastward through remote valleys and sleepy villages, crossing ever-taller passes as the week unfolds. Each night, we’ll settle into cozy chalets and rustic mountain houses, contentedly drifting off to sleep and dreaming of the moment when, on day 6, the Eiger, Mönch and Jungfrau peaks explode into glorious view. We’ll spend the last 3 days hiking through, quite arguably, Switzerland’s most famous and visually satisfying region. That’s not to say that we won’t enjoy eye-popping mountain views during the entire hike. We will, but the fact is, there is something to be said for saving Switzerland’s most prized and stunning mountain peaks for last. This hike offers a number of special elements. 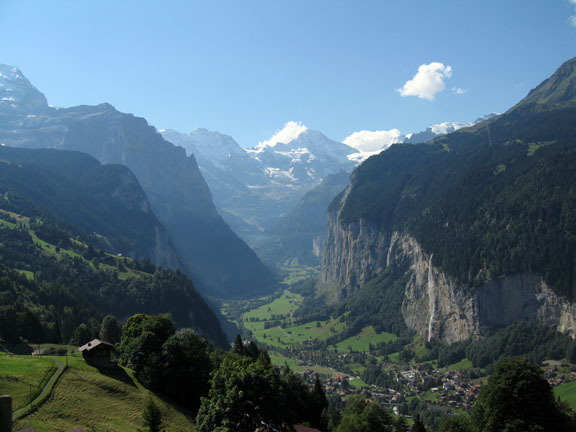 First, it’s centered specifically on the Jungfrau region, the most dramatic locality within the Berner Oberland. 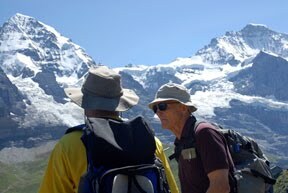 Each day we’ll hike within full view of the sparkling Eiger, Mönch and Jungfrau peaks. Second, this trail is a loop hike, meaning that we’ll enjoy unparalleled flexibility to amend the itinerary to our heart’s delight. We can eat, drink, hike and repeat in proportions that satisfy the desires of the group. We’ll also take in famous side attractions including Interlaken, bustling hub for all things Swiss and outdoorsy chic, the Schilthorn, filming location for the James Bond film On her Majesty’s Secret Service, and the Schinigge Platte railroad, one of Switzerland’s oldest and most attractively positioned railways. The Jungfrau Trail is also our shortest Berner Oberland itinerary, making it perfect for travelers that would like to hike the Swiss Alps in the shortest period of time. 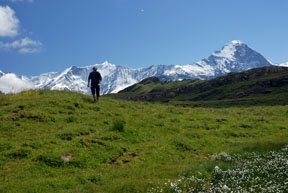 At 10 days/9 nights, the Via Alpina Stage 2 is the longest of our Berner Oberland expeditions, and it’s a great way to de-stress from everyday life. 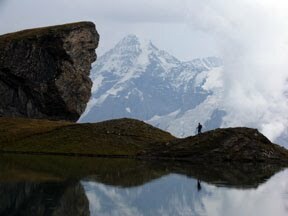 If you want the grandaddy of hikes through the central Swiss Alps, then this trip is for you. Beginning in the mysterious little village of Meiringen, the birthplace of meringue and the setting for the fictional death of Sherlock Holmes, we’ll progress through the bustling Jungfrau region before continuing westward and slowly leaving civilization behind. Put simply, it’s a magical experience to walk away from the tourists and delve into the peaceful heart of Switzerland’s alpine land. You’ll also get bragging rights. Not many people can say they’ve walked nearly the entire width of Switzerland’s most famous mountain region. *Note: All three tours offer Ryder-Walker’s signature sampling of traditional Swiss alpine food, drink and accommodation. The Eiger Trail is almost sold out, but we still have space on the Jungfrau Trail and Via Alpina Stage 2. Please contact us if you’re interested in any of these tours.